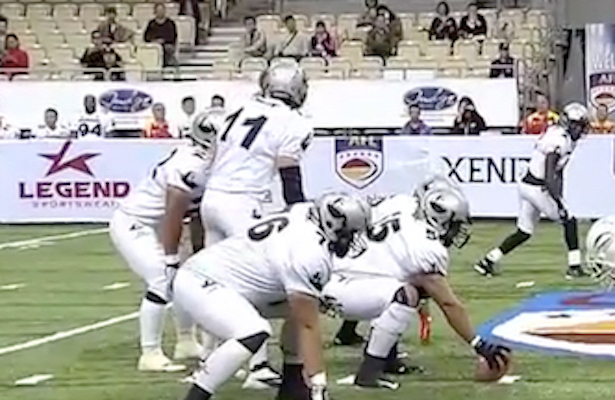 It’s not often when a 6-4, 315lb lineman steals the show but that Dashawn Johnson set the stage during the pregame warm up and then carried that script through to the final curtain as the Guangzhou Power pasted the Dalian Dragon Kings 40-7 in the CAFL game in Qingdao. While his team was warming up Johnson stood in one end zone and fired balls into the net at the other end of the field with his right arm. He then proceeded to play long toss with his left. “I can throw it about 80 yards he said, just something I can do.” He also can block as an offensive lineman and run as a bruising fullback as the Dalian Dragon Kings found out in the first quarter. After Power Quarterback J.J. Raterink connected with Lavasier Tuinei on an eight year touchdown strike Johnson went to work. Taking over on downs with a short field the Jersey City, New Jersey native carried five yards to the eight and on first and goal from the four took a hand-off and left several players in his wake on his way into the end zone. The Guangzhou defense played its part as well. There opening act limited Dalian to just 11 offensive plays in the first quarter not giving up a first down. Frank Trotter, Tyre Glasper and An LI controlled the font line while Virgil Gray and Cameron McGlenn locked down the receivers. In the second frame another short field led to a Raterink sneak and the route was on with the Power up 20-0. On the next series Dalian did get it’s only first down of the half on a broken play but quarterback Jawad Yatim suffered a leg injury and left the game. The half closed with Duane Books catching a TD pass from Raterink who finished 17 of 21 for 155 yards and three scores. The shutout was averted when Dalian’s Phillip Garcia connected with Talib Wise with a nine yard toss. It would be the Dragon Kings only points of the night. For Wise it was his fourth scoring play of the season as he finished with 10 receptions for 93 yards and the touchdown. The second half featured just two scores with Tuinei gabbing his second score of the night and his seventh of the season and Ratterink adding a second short plunge. The Power Defense controlled the tempo with sacks by Glasper and Jamal Giddens while Trotter and Giddens added fumble recoveries. Offensively Johnson continued to rumble in the second half as he finished with 47 yards on ten carries. With the Victory Guangzhou is now 1-2 while the Dalian fell to 0-3.